We’d love your help. Let us know what’s wrong with this preview of Up in the Old Hotel by Joseph Mitchell. To ask other readers questions about Up in the Old Hotel, please sign up. The stories -- perhaps profiles is the better term -- are brilliantly written in a straightforward expository style, and often laugh-out-loud funny. "Lady Olga," for instance, is a profile of circus sideshow bearded lady Jane Barnell in her sixty-ninth year. "Professor Sea Gull" is about the inimitable Joe Gould, that woebegone lecturer of the streets and coffee houses (when someone else was paying), about whom Mitchell would later write a longer piece, "Joe Gould's Secret," also included here. Mitchell's summary of Gould's nine-million word treatise "An Oral History of Our Time" (unpublished) is fascinating and alone worth reading, yet the essay offers so much more. In many essays, it's as if Mitchell is simply taking testimony. "The Gypsy Women" is mostly a verbatim talk that was given to the author and two novice NYPD detectives by the longtime Commander of the Pickpocket and Confidence Squad. In "The Deaf-Mute Club" he relates a visit to that self-same club where he exchanged long handwritten notes with the club's president, which are transcribed without interruption. In one essay we learn of the penniless drifter who wrote improvised checks on paper bags for many thousands of dollars to kind people who'd helped him; and the man who couldn't abide swearing and so started the Anti-Profanity League in 1901. Mitchell, like Whitman, celebrates the individual, and like the great poet he has a penchant for the catalog, which he uses to brilliant effect. His rhythms, moreover, his prosody, can be downright sonorous. He has a fantastic ear for colloquial speech and the writing is jam-packed with vivid description, yet never overly freighted. One of those rare treasures that just gets better with age. A one-man lesson in the cleanest yet most lyrical non-fiction you're likely to find anywhere. Whenever I need to clear my head and cleanse my soul, I pull out this book and reread any one of dozens of favorite passages. A kind of poetry of the streets -- Whitman would've loved Mitchell, I'm convinced of it! I'd match "Joe Gould's Secret" with any famous novella in American Literature. "Done by aproned, middle-a One of those rare treasures that just gets better with age. A one-man lesson in the cleanest yet most lyrical non-fiction you're likely to find anywhere. Whenever I need to clear my head and cleanse my soul, I pull out this book and reread any one of dozens of favorite passages. A kind of poetry of the streets -- Whitman would've loved Mitchell, I'm convinced of it! "The sturgeon rose twice, and cleared the water both times, and I plainly saw its bristly snout and its shiny little eyes and its white belly and its glistening, greenish-yellow, bony-plated, crocodilian back and sides, and it was a spooky sight." Mitchell often said that Joyce's Finnegan's Wake was one of his favorite books, one he read over and over. At first, this would seem an unlikely choice, but once you immerse yourself in his prose, you begin to hear some of the same cadences and gallow's humor in Mitchell's words. OK, this is an anthology. Some of the essays are clearly better than others. I certainly didn't love them all! I have put my star rating for each essay on the content list provided below. When I look back on this book my overall feeling is that if these stories had never been written so very much would be lost. In this respect, for the sake of the best stories/essays, the book is in my mind worth five stars even if some are not that good. As a whole I am giving it four stars. I really did like t OK, this is an anthology. Some of the essays are clearly better than others. I certainly didn't love them all! I have put my star rating for each essay on the content list provided below. When I look back on this book my overall feeling is that if these stories had never been written so very much would be lost. In this respect, for the sake of the best stories/essays, the book is in my mind worth five stars even if some are not that good. As a whole I am giving it four stars. I really did like the whole reading experience. I am really glad I read this book. How can I describe it? Who will enjoy this? It is not going to fit everybody. I am going to speak about the best stories / essays. As stated below, some are fact some are fiction ,but all are based on the author's interviews with real people - fishermen, gypsies, colored folk, denizens of the Bowery. The characters are those who are ‘down and out’. Are you able to look with compassion on such people? Are you curious about New York and its environs at the turn of the 20th Century and through the Depression? Do you want to get under the surface, to really comprehend people who are not like YOU? New York City is so diverse; you cannot capture the whole city in one book. If I have to pick one group on which the book focuses it would be the fishing folk. I knew very little about fishing .......baits and nets and barges, culinary tricks, the fishermen's life on New York's waterfront. Not today, but back then. How was life there in the harbor back then. (I am dying to know how much of this world remains.) You leave the book with an understanding not only of the factual details, which I will surely forget, but also about a whole other way of living. This I will not forget. When you read the book use Wiki. Look at maps of the harbor and images of the fish and the boats and the people there. It is pretty amazing how people’s life trajectories can be so varied. What the author does is start with the facts and then he goes deeper and deeper by looking at people who everyday live with those details, those things just described. Mitchell goes from things and numbers to soul. From the outer to the inner. The facts become utterly fascinating because they are tied to flesh and blood people. It is important to read this book with Man in Profile: Joseph Mitchell of The New Yorker. Mitchell used shorthand to record what people said. He had a knack for listening. You may wonder otherwise how Mitchell was he able to capture such long soliloquies and dialogs?! I very highly recommend listening to the audiobook. I absolutely adored the narration by Grover Gardiner. He reads slowly. He captures with his intonations the character of the people talking. Absolutely wonderful. Could not be improved upon. You do not need the paper book, but sit by your computer and look at maps of the city. Look at the fish and the fishermen and the barges. It is all there on internet and easy to see. Rarely can a book's maps be as informative as what you can find on the net. I don't even know if the paper book has maps or pictures. At the end of my review is a list of the stories/essays and how they are arranged in the book. I have indicated how I reacted emotionally to each one. 5 stars – these are utterly amazing! I have for clarity indicated which are fictional and which are factual, also which stories were added by the author and thus not to be found in previous collections. Joe Gould's Secret can be classified as a novella, but it concludes the set of stories found in The Bottom of the Harbor. It is a perfect ending to the anthology. It was the last of Mitchell’s writing, published in 1964. Joe Gould and Joseph Mitchell, they share an understanding about writing, about what should be written and why sometimes you just cannot write any more. The two men are not the same. There is a lot to think about here. Some sketches are marvelous because they capture an individual or the feel of a place. Some you read for the interest of the topic covered - Calypso music, gypsies, the Bowery, the New York waterfront or the Fulton Fish Market. The setting is New York City, the early 1900s and the Depression years. Up in the Old Hotel is split into three sections: "McSorley's Wonderful Saloon", "Old Mr. Flood" and "The Bottom of the Harbor". Each section is composed of different character sketches/essays. Some sketches are factual, some fictional. All in "The Bottom of the Harbor" are factual. The stories/sketches in "Old Mr. Flood" are fictional. The stories/sketches in "McSorley's Wonderful Saloon" are factual OR fictional. When I have finished the book I will add a complete list of the names of the separate stories. The book starts with an introduction by David Remnick and then an author's note which explains how Mitchell organized this, his last anthology. Seven additional sketches were added: The Gypsy Women, The Spism and the Spasm, The Deaf-Mutes Club, Santa Claus Smith, The Mohawks in High Steel, The Kind Old Blonde and I Couldn't Dope It Out. The Mohawks in High Steel was used as an introduction to Edmund Wilson's Apologies to the Iroquois with A Study of the Mohawks in High Steel. None of the other additions had been reprinted. All sketches from his previously published collections McSorley's Wonderful Saloon (1943), Old Mr. Flood (1948), The Bottom of the Harbor (1960*) and Joe Gould’s Secret (1965) are in this anthology, but reorganized. *According to the author's words in Up in the Old Hotel. Other sources set the publication date for 1959! In this collection of pieces that he wrote for the New Yorker, mostly in the 1940s and 50s, Mitchell takes us to an older and stranger New York. This journalist had an affinity for the oddballs, the eccentrics, the solitary men who despite their flaws had important things to share with the rest of us. It is primarily a collection of profiles of such individuals: the head of a small anti-profanity organization, a crusty fishing captain and Sunday painter, a retired fish market worker, a compassio In this collection of pieces that he wrote for the New Yorker, mostly in the 1940s and 50s, Mitchell takes us to an older and stranger New York. This journalist had an affinity for the oddballs, the eccentrics, the solitary men who despite their flaws had important things to share with the rest of us. It is primarily a collection of profiles of such individuals: the head of a small anti-profanity organization, a crusty fishing captain and Sunday painter, a retired fish market worker, a compassionate but tough woman who gives the drunks on the Bowery a helping hand, a retired gentleman who is a leading citizen in a small African-American community on Staten Island, and most famously, a Harvard-educated crackpot and Greenwich Village street character named Joe Gould. Mitchell was a small town North Carolinian who made his way to New York and worked as a newspaper reporter before landing a position at the New Yorker, where he became one of the 20th century's most beloved and influential journalists. His personal and meticulous style of non-fiction writing is given credit for being an influence on the 1960s New Journalism movement, and on many other writers as well, such as John McPhee. For him, New York must have been an exciting and exotic place, althou he never makes himself the subject of his pieces, so it is hard to know for sure. But follow him around in the pages of this book and you see a man who was drawn to outsiders and oddballs, and who portrayed them in a full and sympathetic manner. The streets of New York City that he wrote about are long gone now. One could still see glimpses of them in the 1980s, e.g. I recall meeting a character in a bar back then (that served 50 cent beers, something unimaginable today) who had fought in the Hungarian uprising, and following political asylum, became an alcoholic in the bars on 14th Street. That character could have made an appearance in a Mitchell piece. But the rents are now too high and the people too suspicious and unforgiving for the likes of Commodore Dutch to thrive today, a man who got along by making people laugh and selling tickets to an annual ball in his honor. But thank goodness we still have Mitchell's accounts to remind us. Pretty much every piece is fascinating, but here are a few that really stayed with me. There is a long description of McSorley's, one of the oldest Irish saloons in America (and still going strong today), and the men who fraternized there. In "The Gypsy Women", an experienced policeman shares with us his extensive knowledge of the bands of gypsies in New York, their origins, and most interestingly, the con games that their women run, usually on emotionally disturbed women who bumble into their fortune telling parlors. There are number of pieces on the maritime life of the city - the old sailors, the fish mongers, and others in the seafood trade. There are pieces that enlighten us about sturgeon fishing and the lives of seamen in Edgewater, NJ (things of the past now), as well as a discussion of the waterfront's rat population. In the title piece, Mitchell joins restauranteur Louis Morino, proprietor of Sloppy Louie's, as he explores the previously unknown regions of the building above his restaurant, where they find much that has not changed since its days as an active harborside hotel. Best known of all his characters however was Joe Gould, a highly intelligent Bohemian, drunkard, and beggar who was always scribbling in notebooks and was supposedly working on an oral history of the Greenwich Village scene. Gould, who almost certainly suffered from some sort of mental illness, was the offspring of a well-to-do Yankee family in Massachusetts, the son and grandson of doctors. His relationship with Mitchell is gone over in great detail, and I came to feel an affection for him, as many did, as well as a sense of relief that he is not coming around and ringing my doorbell. read about half of this (it's over 700 pages), and will get back to it, but it's a library book and had to go back. Fantastic articles about eccentrics and 'tribes' in New York, including tales of bar fights and grumpy landlords, gypsy kings, a couple who lived in a cave in Central Park. All around 1930-50. Again the book came to life for me because I was in the streets mentioned, particularly Mott Street, Mulberry St. etc. - visiting my daughter who lives nearby. Of course they have now been lar read about half of this (it's over 700 pages), and will get back to it, but it's a library book and had to go back. Fantastic articles about eccentrics and 'tribes' in New York, including tales of bar fights and grumpy landlords, gypsy kings, a couple who lived in a cave in Central Park. All around 1930-50. Where has this been all my life? This has quickly shot up to my "Top Ten of All Time." It's actually more a compendium of non-fiction New Yorker magazine stories from 1932 to approximately 1957. It would make a good companion piece to Jacob Riis, except that these portraits are much more lengthy and personal, and the author does not look down on his subjects. He actually enjoys the company of the various beggars, saloon keepers, carnival performers, gypsies, street preachers and hoarders he writ Where has this been all my life? This has quickly shot up to my "Top Ten of All Time." It's actually more a compendium of non-fiction New Yorker magazine stories from 1932 to approximately 1957. It would make a good companion piece to Jacob Riis, except that these portraits are much more lengthy and personal, and the author does not look down on his subjects. He actually enjoys the company of the various beggars, saloon keepers, carnival performers, gypsies, street preachers and hoarders he writes about. Perhaps the most famous of these was "Mohawks on High Steel" which told a story I was somewhat familiar with about Native Americans from a single reservation in Canada who found a niche as steel workers. They worked on almost all the skyscrapers in New York and elsewhere from the 1920s onward and formed an expatriate community in Brooklyn. He also spends a great deal of time on the city's nautical culture and remnants of the once huge oyster industry. The portrait of the Fulton Street Fish Market, though told via a composite character named "Old Mr. Flood," a crusty habitue of the area, captures the ambiance and customs of a system that remained largely unchanged since the market opened in about 1830. Perhaps most affecting (and they are all "un-put-downable") is his portrait of "Professor Seagull" and the follow up piece written 25 years later called "Joe Gould's Secret." It is a lengthy saga about a homeless "Bohemian" with literary pretensions in Greenwich Village. He claimed to speak "Sea Gull" and had translated Longfellow and other poets into their language. Though he lived on handouts from acquaintances who kept him at arm's length (including the likes of ee cummings), his erudition on various subjects and "instant-recall" memory, got everyone, including the author, curious about his "Oral History." Though nobody had ever seen it, it was reputed to be a one million-word plus opus comprised of overheard conversations of a cross section of the demi-monde such as: orderlies at Bellevue "talking shop" and snatches of conversation overheard in bars and parties where the artists and writers hung out. Everyone thought it would either be fascinating or a self indulgent bore. Either way, Gould insisted that scholars of the future would want to study it to find out what people really thought. After all, his constant boast about his privileged Brahmin upbringing -- "The Goulds were the Goulds when the Cabots and the Lodges were clam diggers" -- turned out to be true. Therefore, anything was possible. Like Tom Wolfe's "New Journalism," Mitchell has a way of making you intensely interested in people and places in which you thought you had no interest (and he has an uncanny ability to record lengthy diatribes in the subject's own words). His portrait of a community of Shad Fishermen in Edgewater, NJ circa 1950 -- many of whose ancestors went back to the 1630s in that location -- made me want to go there and see it for myself (except of course that it has been obliterated recently by condos and high rises). The same thing happened to Sandy Hill in southern Staten Island, where Free Black Oyster fishermen and their descendants lived since the 1630s, until about 20 years ago when it fell victim to aggressive developers. I wanted to read this collection since 1992, when it first came out. Finally, last November, my friend Fiona loaned me her well-worn copy. It had been to Alaska and back with her, and who knows where else. At some point early in the new year, I began to read the book, first reinforcing the cover with clear packing tape. Fiona, you know me too well. The book was a revelation, one of the best I've ever read. Even if I took my sweet time with it. Its 700+ pages hold 37 of Mitchell's New Yorker essay I wanted to read this collection since 1992, when it first came out. Finally, last November, my friend Fiona loaned me her well-worn copy. It had been to Alaska and back with her, and who knows where else. At some point early in the new year, I began to read the book, first reinforcing the cover with clear packing tape. Fiona, you know me too well. The book was a revelation, one of the best I've ever read. Even if I took my sweet time with it. Its 700+ pages hold 37 of Mitchell's New Yorker essays, including a few short stories, ranging from 1940 to 1964. The first covers McSorley's Wonderful Saloon, and I was immediately hooked. McSorley's survives—I first visited in the summer of 1990—but for the most part the book chronicles a forgotten New York. And it's the rough-and-tumble side, the Bowery, the Seaport, after hours at the police station, the bars, diners, cemeteries, and everywhere in between. And oh the characters he meets, poets and preachers, iron workers and movie-house managers, schemers and dreamers. Along the way we watch Mitchell grow as a writer. His earliest pieces often end abruptly. He becomes a more nuanced storyteller. He takes some stabs at fiction but I think soon realizes that real life is where the action is. I can see a strong influence on a later New Yorker writer (and another favorite) John McPhee, especially in Mitchell's later work. They both become so enmeshed in their topic that they want to convey every detail, and just when it seems too much, a character is introduced to put a human face on the story. (Interestingly, the two men provide the only two pieces I've ever read about shad.) But Mitchell gets the nod, because he's much more willing to get down and dirty, and at the end of the day, his topics are just more fun. Glorious. Probably the best non-fiction I have ever read and probably the best anything I have read in a decade. Not that this is surprising - that line about ‘Hemingway for fiction; Joe Mitchell for non-fiction’ makes the point. This is where the normal arguments for fiction (that it brings a place and a time more vividly to life than non-fiction / history / social history) go rather out of the window. This reads like the best fiction, with the powerful feeling that these places exist / existed Glorious. Probably the best non-fiction I have ever read and probably the best anything I have read in a decade. Not that this is surprising - that line about ‘Hemingway for fiction; Joe Mitchell for non-fiction’ makes the point. This is where the normal arguments for fiction (that it brings a place and a time more vividly to life than non-fiction / history / social history) go rather out of the window. This reads like the best fiction, with the powerful feeling that these places exist / existed and that these people lived and breathed and died. You’re in the company of a very respectful, humble raconteur with an ear for conversation and a nose for character - and he’s pretty interesting himself, by the way (he’s into wild flowers, c’mon). It’s what I once hoped that I would get, in my ignorance, from writers like Ian Sinclair (before I realised that ‘psychogeography’ meant ‘wittering incoherence and navel-gazing bearing little relation to the people or place it purports to evoke’). It’s a box of ghosts or a vivid HD documentary about a small number of lives in precise streets and buildings and restaurants. And it becomes all the more moving precisely because they existed. The profile of Phillipa Duke Schuyler is unbelievably endearing; then I went onto Wikipedia and read what became of her and, well, bloody hell. It’s given me a month’s worth of places and street corners and locations in that city that I could not but want to go and see. Even if there’s just a Starbucks there now or a faux blue collar neighbourhood with some ghost advertising and its own tote bag, it’s where that happened. If such a book existed for London or another city, it’d work just as well of course, but for me it acquires greater poignance by happening at the epicentre of the greatest nation that ever existed (spot the Americanophile), at what then was approaching its high water mark. NB It’s long, so if I had to priortise any of the books-within-books, go for ‘McSorley’s Wonderful Saloon’. I normally react to the line “I didn’t want it to end!” in book reviews a bit like I do to “A hidden gem!!! !” on Tripadvisor (you want to get to the end of books so you can read other books, right). But I found myself taking longer with it, as it’s so damn pleasurable. I have no real context with the city or the milieu, and yet the pieces worked for me. Like old wine, Mitchell's work keeps growing on me. And I see a close cousin of him back home in R K Narayan, who must have walked among the city folks with open eyes and ears, to draw inspiration for his many characters who populate Malgudi. How far, I wonder, is Narayan's Selvi from Mitchell's Mazie (one fictional and other non-fictional); and though separated by a vast geographical gap, I see that their (and I have no real context with the city or the milieu, and yet the pieces worked for me. Like old wine, Mitchell's work keeps growing on me. And I see a close cousin of him back home in R K Narayan, who must have walked among the city folks with open eyes and ears, to draw inspiration for his many characters who populate Malgudi. I don't recall ever having heard of of Joseph Mitchell or "Up in the Old Hotel" until it was recommended to me. This seems odd considering how many books I've read and loved of a similar nature. It is a collection of journalistic writings (mainly from the New Yorker magazine) about people and things in and around New York City from the 1930's to the early 1960's. Mr. Mitchell's focus is on the characters and establishments that gave New York a flavor that, sadly, doesn't exist much anymore. 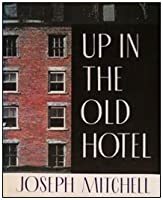 We ge I don't recall ever having heard of of Joseph Mitchell or "Up in the Old Hotel" until it was recommended to me. This seems odd considering how many books I've read and loved of a similar nature. It is a collection of journalistic writings (mainly from the New Yorker magazine) about people and things in and around New York City from the 1930's to the early 1960's. Mr. Mitchell's focus is on the characters and establishments that gave New York a flavor that, sadly, doesn't exist much anymore. Collected works of arguably the greatest nonfiction writer ever. You will find out more about NYC history here than in any other book on the subject. 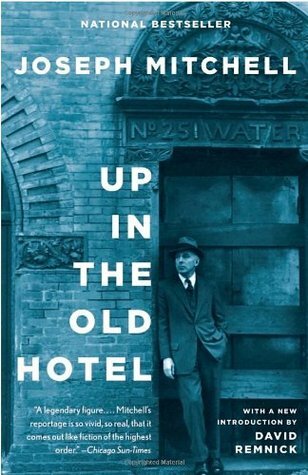 Up in the old Hotel is an anthology of exceedingly well-crafted profiles by Joseph Mitchell, who wrote for The New Yorker for many years. I suspect that this anthology might have a rather limited appeal, for like many profiles in the magazine, they are long, meandering pieces. Beyond that, the stories detail people who in most every case are not & never were held in any sort of limelight. Rather, the profiles illuminate those who lived on the margins of New York society 60 or 70 years ago bu Up in the old Hotel is an anthology of exceedingly well-crafted profiles by Joseph Mitchell, who wrote for The New Yorker for many years. I suspect that this anthology might have a rather limited appeal, for like many profiles in the magazine, they are long, meandering pieces. Beyond that, the stories detail people who in most every case are not & never were held in any sort of limelight. Rather, the profiles illuminate those who lived on the margins of New York society 60 or 70 years ago but who were of interest to Mr. Mitchell, someone who traveled the city with a detective's zeal for detail, an attribute merged with a very compassionate attitude about those who were "visionaries, obsessives, impostors, fanatics, lost souls, the-end-is-near street preachers, old Gypsy kings & queens and out & out freak show freaks". In reading these profiles, one thinks of the subjects painted by the Ashcan School, artists such as George Luks, John Sloan & George Bellows, among others. In fact Sloan inhabited & painted McSorley's Old Ale House on 7th Street near the Cooper Union Building (where Abraham Lincoln made a pivotal speech in 1860 several years after McSorley's opened its doors), the saloon that Joseph Mitchell profiles in "The Old House at Home", part of this anthology. The Ashcan School wanted "art to be akin to journalism" & sought to paint the underside of life. Among the many profiles in this 700+ page anthology are those dealing with Mazie, manager of a Bowery movie theater, a Jewish woman who frequents Roman-Catholic churches, regularly doles out alms to the poor & bereft and who is a keen observer of all that moves within her orbit. There is also the Rev. Daddy Hall, an Episcopal priest who believes in the literal nature of the Bible, patrols the Bowery on foot (often waving banners), warning against all manner of "distilled damnation", tobacco, vaccinations, bingo & church suppers. He carries on a spartan and lonely crusade for 15+ years, until the bombing of Pearl Harbor causes a renewal of interest in his apocalyptic message, at which point, the Rev. Hall is suddenly swamped with parishioners who flood his phone line. Then, there is "Commodore Dutch", a hardscrabble fellow of limited education and even less ambition but someone who concocted an association catering to his own preservation by putting the touch on everyone he shared some sort of connection with, mostly fellow gamblers, grifters and Tammany Hall politicians, engendered to pay dues to his "association" in exchange for small favors, with the self-styled commodore the only registered member. Among his sales pitches are: "I hate to bother you but I'm flat & I wonder if you could see your way to pay some dues", said to those of a higher status in the social order and to others, "Get yourself in good standing with the association or I'll excommunicate you." Such unlikely though colorful characters as Commodore Dutch may not seem the sort to arouse general interest but Damon Runyon also did stories on him. While Up in the Old Hotel begins with the tale of McSorley's Old Ale House, it concludes with "Joe Gould's Secret", the longest piece but one for which early on in the anthology, "Prof. Sea Gull" serves as a kind of introduction to perhaps the most memorable character in the series of Mitchell profiles. Joe Gould, alias Prof. Sea Gull, is an itinerant pigeon feeder, fluent in the language of seagulls & a denizen of Bowery flophouses, bars & all-night diners who battles the 3Hs--homelessness, hunger & hangovers. His lure for a polished, urbane writer like Mitchell is Gould's promise of an "Oral History for our Time" that is ultimately to be as long as the Bible and an informal story of "the shirt-sleeve multitudes, laced with palaver, hogwash, flapdoodle & malarkey". Gould lives in a world of pipe dreams but boasts a considerable imagination and hails from a long line of Boston gentry, as both his father & grandfather were Harvard M.D.s and Joe Gould was himself a graduate of Harvard, Class of 1911. The mystery is of course just what caused Gould to dissipate a life that otherwise offered considerable opportunity but the prospect of his work-in-progress, an "x-ray of the soul of the bourgeoisie" allows this bohemian to capture the imagination of many, E.E. Cummings (who dedicated a poem to Gould), Joe Mitchell and several potential publishers of his work among them. Mitchell invests a considerable amount of time in pursuit of Gould's manuscript and in turn, Joe Gould begins to increasingly inhabit the world of Joe Mitchell. Eventually, and in an odd sort of way, Joe Gould's fantasy world parallels some aspects of Joe Mitchell's, with the esteemed writer himself having been a kind of exile from his father's North Carolina tobacco business and with Mitchell having envisioned himself as the author of a response to James Joyce's Ulysses that was to have been set in Manhattan, a novel that represented a long-standing dream that never came to fruition. Ultimately, it is revealed that Gould's projected magnum opus is a sham, causing Mitchell to lament, "My God, it doesn't exist". Gould can offer only that "it is not a question of laziness." Beyond that, the life-lie or pipe-dream of Joe Gould seemed to be the only thing that kept him going. In the end, one is reminded of a one act play by Eugene O'Neill, where the main character in Hughie laments that "if every man who walked down Broadway & liked to kid himself were to drop dead, there wouldn't be nobody left." In some ways, the concept of an oral history caused me to think of Chicago's Studs Terkel, author of so many well-developed books such as Working and Division Street, America, that captured the thoughts & feelings of plain-speaking folks, people who appealed to that author's populist sensibility. Joseph Mitchell was a masterful writer who had an ability to encapsulate the particular spirit that animated so many otherwise ordinary people. For whatever reason, the revelation following so many encounters with Joe Gould seemed a major stumbling block for Mitchell, who continued to come to his office daily for another 30 years but who never completed another story. There is a very atmospheric film version of Joe Gould's Secret, featuring British actor Ian Holm as Joe Gould and Stanley Tucci as Joseph Mitchell. A disclaimer: I only read about 2/3rd's of this book. It's around 750 pages, but some of the stories were either too antiquated to read or were of a topic too sensitive for me to read (ex. the raising of terrapins for future consumption - couldn't handle that. Although, it did remind me of the magical Terrapin Station!). Otherwise, Mitchell's book is fantastic. He was a reporter for the New Yorker from the 1930's to the 1990's. These stories are all profiles he made of the common man and, specif A disclaimer: I only read about 2/3rd's of this book. It's around 750 pages, but some of the stories were either too antiquated to read or were of a topic too sensitive for me to read (ex. the raising of terrapins for future consumption - couldn't handle that. Although, it did remind me of the magical Terrapin Station!). Otherwise, Mitchell's book is fantastic. He was a reporter for the New Yorker from the 1930's to the 1990's. These stories are all profiles he made of the common man and, specifically, Depression-era New York . If you're even remotely a fan of history and the forgotten people of America this book is a must read. The subjects are nobodies: bums, gypsies (very politically incorrect story), scam artists, clam fisherman, and seedy bar owners among others. Mitchell really digs into these misfit's lives and exposes a kind of lost America. I couldn't help thinking of these people as characters in a Tom Waits song. In particular the story Joe Gould's Secret, which is apparently Mitchell's crowing achievement, is fascinating. This guy was compiling a book called the Oral History of the World. Basically, he was just an eccentric drunk, but Mitchell's ability to flesh out such a unique character and turn him into a kind of hero is very impressive. I knew nothing about Joseph Mitchell before I picked this book up and out of a sale bin. Am I ever happy that I did because now I know just how well he wrote. Apparently he never wrote a thing again after the last bit in this collection "Joe Gould's Secret". Thirtyish years going to his offices in the New Yorker everyday but never writing anything again. Part of me feels, sayang, but the other part of me thinks, its okay because what he did produce before those dry years was astonishing. Mitchell I knew nothing about Joseph Mitchell before I picked this book up and out of a sale bin. Am I ever happy that I did because now I know just how well he wrote. Mitchell gained a reputation on his ability to find and portray the eccentrics of New York and he does it in a way that combines a good reporters detached attention to detail, an astonishing ear and memory for dialogue and a bit of dry, sometimes black humor. His portraits bring his subjects to stark life - some are a little less then flattering - softened with just a touch of understanding fondness. I re-read this book every couple of years. It's both a way to time travel to the New York of the earlier twentieth city and an immersion in that compelling yet somehow effortless prose that drives me to pick up the New Yorker every time I see it. I want to visit the New York Mitchell describes, and I feel deeply cheated that it's gone. This isn't just New York, the center of the civilized world, it's New York as a place that grew up out of a Dutch settlement surrounded by long grass at the confl I re-read this book every couple of years. It's both a way to time travel to the New York of the earlier twentieth city and an immersion in that compelling yet somehow effortless prose that drives me to pick up the New Yorker every time I see it. I want to visit the New York Mitchell describes, and I feel deeply cheated that it's gone. This isn't just New York, the center of the civilized world, it's New York as a place that grew up out of a Dutch settlement surrounded by long grass at the confluence of two rivers. Mitchell somehow evokes the ground under the city, the water all around it, as well as the eccentric characters who wandered through it in the twentieth century. Gypsies, rats, oyster boat captains, a couple living in a cave in Central Park, all capture Mitchell's attention, and he presents them in a way that makes you wonder why you never thought about them before. This is a quirky collection of stories about New Yorkers: musical prodigies, gypsies, fishermen, preachers, gluttons, collectors, and eccentrics of all varieties. It was amazing to me how Mr. Mitchell ( a reporter) could win the trust of such a diverse circle. He seemed right at home with all if them, settled down with them in their favorite haunts, won their confidence, and then penned the experience so vividly that you feel you really understand these folks. The last story, "Joe Gould's Secret This is a quirky collection of stories about New Yorkers: musical prodigies, gypsies, fishermen, preachers, gluttons, collectors, and eccentrics of all varieties. It was amazing to me how Mr. Mitchell ( a reporter) could win the trust of such a diverse circle. He seemed right at home with all if them, settled down with them in their favorite haunts, won their confidence, and then penned the experience so vividly that you feel you really understand these folks. The last story, "Joe Gould's Secret," crackled with life. The author's emotional investment in a brilliant, homeless writer was palpable and set this chapter apart from the others. My post-reading research revealed the reason. Joseph Mitchell identified with the man Joe Gould, who has been dubbed a "Greenwich Village bohemian," almost to the point of making him his alter ego. Popisná stránka byla dokonalá (někdy jsem měla dojem, že se musím každou chvíli probudit do letního dne s atlasem květin pod paží a dívat se z dálky na vrcholky mrakodrapů v New Yorku), ale bohužel se nedostavilo to, co u povídek běžně hledám a oceňuji - zajímavý dějový spád a pointy (konce některých povídek mi připadaly hodně nevyužité). Možná to zkusím ještě v jiném rozpoložení.. I'm re-reading this now. Each essay reveals something new and surprising about early 20th century New York City. My favorites are the Old Mr. Flood essays, where you learn a lot about Fulton Fish Market and the characters that wander there. I never expected to be so engrossed in a essays about fishmongering (I'm vegan), but everything is so lively and quotable and delightful, it really doesn't matter how you feel about fish. It's hard to tell whether New York was once a bigger, more interesting, more varied place - neighborhoods of gypsies and Mohawks and rich bankers and Irish mobsters and black oystermen and Italian fishmongers and down-and-out bohemians and Bowery flophouse bums and writers and scoundrels and drunks and saints and preachers, the fabulously wealthy next to the well to do next to the rising, working poor next to the indigents and luckless, all within a couple stone throws away from each other in a It's hard to tell whether New York was once a bigger, more interesting, more varied place - neighborhoods of gypsies and Mohawks and rich bankers and Irish mobsters and black oystermen and Italian fishmongers and down-and-out bohemians and Bowery flophouse bums and writers and scoundrels and drunks and saints and preachers, the fabulously wealthy next to the well to do next to the rising, working poor next to the indigents and luckless, all within a couple stone throws away from each other in a cacophony of life, sometimes weird, often hard, always unexpected - or whether our time simply doesn't have its Joseph Mitchell. Perhaps both. Duane Reade's are the same whether you find them in Inwood or in Greenwich or in Park Slope or in Bensonhurst. But the variety of life is still there, just more hidden, perhaps - less sure of itself and less willing to show the world what's what, being pushed further out to the edges, the center hollowed out, playground of the rich or those pretending to be rich, thinking it's normal to pay a king's ransoms for warehouse luxury apartments with expensive makers markets on the ground floor filled with the dross of a decadent civilization. At least there are bike lanes now, you say. Mitchell's is the story of, not Old New York - that'd be the 19th century, I think - but the New York beyond our cultural ken, the New York of the 20s, 30s, and 40s, before the despoliation and rottenness that began to eat at its being as early as Robert Moses and before his gifts bore their terrible fruit in the horrors of the 70s and beyond. Nor is this the misplaced "nostalgic" New York of the new yuppie classes - that'd be the New York of crack and crime and cheap brownstones serving as crack and crime dens. It's the New York as it was promised to be, as cities perhaps should be. Not one massive horrid stretch of blight - but not one massive glittering tower of floor-to-ceiling glass replete with $15 gin-and-tonics either. New York as told by Mitchell was a real place, a real thing, as we millennenials would say. I discovered Up in the Old Hotel almost a dozen years ago and fell in love with Joseph Mitchell and his paean to times gone by in New York City. He spoke to me of places I’d visited, some that seemed familiar, and others I could only imagine. For example, there was the Fulton Ferry Hotel, a six-story place on South Street that housed Sloppy Louie’s 80-seat restaurant that opened at 5:00 a.m. for the fish peddlers and mongers. The area was pungent with the smell of the market then and the ghosts I discovered Up in the Old Hotel almost a dozen years ago and fell in love with Joseph Mitchell and his paean to times gone by in New York City. He spoke to me of places I’d visited, some that seemed familiar, and others I could only imagine. For example, there was the Fulton Ferry Hotel, a six-story place on South Street that housed Sloppy Louie’s 80-seat restaurant that opened at 5:00 a.m. for the fish peddlers and mongers. The area was pungent with the smell of the market then and the ghosts of generations now gone. (Louie used the bottom two floors, but never dared take the rope-propelled elevator to the floors above.) My friends once lived in lofts like this. Mitchell’s book is an anthology of his writing for the New Yorker — four books, actually — : McSorley Wonderful Saloon (1943), Old Mr. Flood (1948), The Bottom of the Harbor (1960) and Joe Gould’s Secret (1965). And these books were each a compendium of stories. And what stories! Back in the day, Mitchell’s acquaintances swore they could tell which part of the ocean — from Staten Island to Long Island — that an oyster came from, simply by its taste. And the other characters include Mazie, the bearded Lady Olga, Professor Sea Gull, Santa Claus Smith and so many more who make up the anthology of McSorley’s ale house. (No women were allowed there until recent years.) I’ve drunk McSorley’s green ale at thirty-five cents a glass and eaten their crackers and horse radish and can only feel remorse that I wasn’t a grownup decades earlier when it was a hangout for newspaper reporters. Mitchell wrote for The New Yorker from 1938 until he died in 1996. Charles McGrath wrote in the Apr. 27, 2015 issue.”Mitchell practiced what he called a ‘wild exactitude,’ and his style is hard to describe except by extensive quotation. His writing is at once spare and leisurely, lyrical and precise, funny and a little mournful.” His writing, while not entirely fiction, may be classified as “creative non-fiction” for the quotes he massaged until the poetry emerged. Even Harold Ross, who founded the magazine, recognized no one really spoke in complete, articulate paragraphs. My Shakespeare professor used to call nostalgia “soft cultural primitivism” — a longing for the good old days. But Mitchell didn’t drown in the pathos or the romance or the graveyard humor of these characters. He called his subjects “visionaries, obsessives, imposters, fanatics, lost souls, the-end-is-near street preachers, old Gypsy kings and old Gypsy queens, and out-and-out show freaks.” In a New York Times profile in Oct. 23, 2005, Mitchell was described as a writer whose “observations have a lapidary quality that freezes a moment in time.” He simply made people and events beautiful as I’ve tried to do in my own writing. The one half of this anthology that was NOT about seafood of any kind was great! A nice look back at old New York, bookended by two brilliant profiles. Joseph Mitchell was an American writer who wrote for The New Yorker. He is known for his carefully written portraits of eccentrics and people on the fringes of society, especially in and around New York City.